A few weeks back I saw some new stamping plates on facebook group Adventures in Stamping, by Moon Nail Supplies. The plates I saw had a whole range of My Little Pony images on them. This is plate Moon NS1, (NS3 is the second one). There was no way I could resist buying the plates given my daughters obsession with all things MLP. 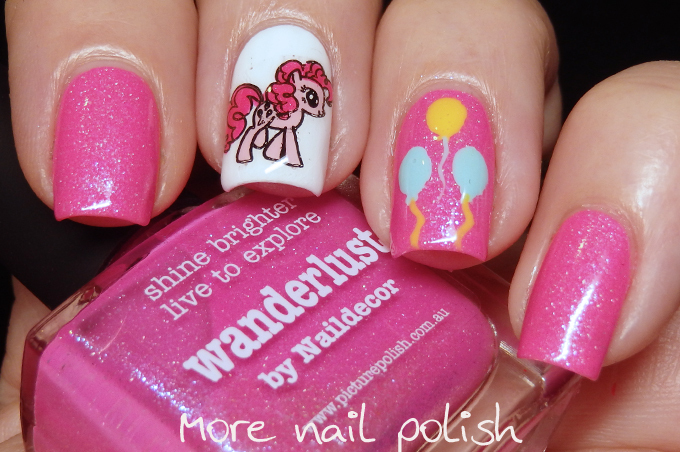 I also recently received Picture Polish Wanderlust in the mail which was just the most perfect pink polish to pair up with Pinkie Pie (oh that line is almost a tongue twister). 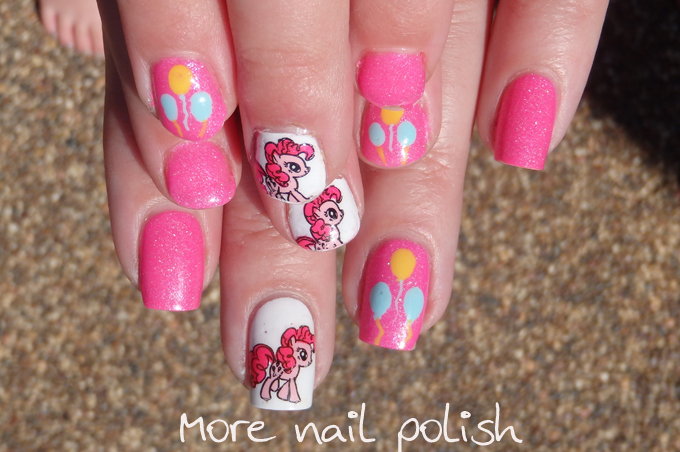 I created a decal for Pinkie Pie using my Uber Chic mat, colouring it in with Picture Polish Fairy Floss and Hot Lips. Wonderlust is a gorgeous bright candy pink with a strong blue shimmer and a fine sprinkling of scattered holo. Coverage is great and is shown here at two coats. Wonderlust is a collaboration shade with Canadian Instagrammer Manal aka Naildecor. 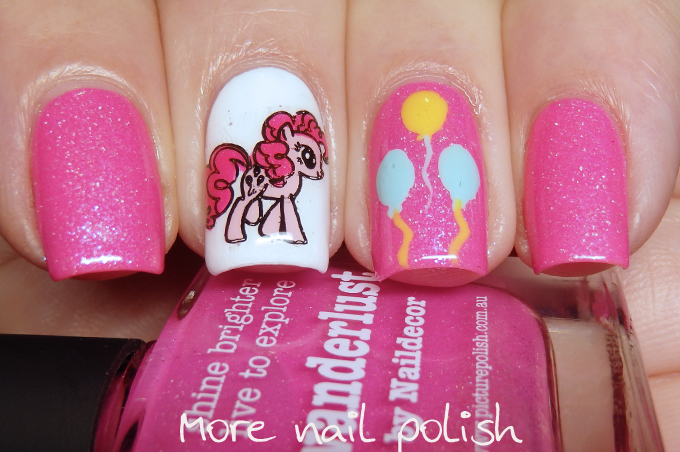 Of course Miss 4 had to have matching Pinkie Pie nails! She managed to keep these on for more than 24 hours before picking them off. I figure if she can wear a mani for as long as me, then she's doing ok, but I've told her I will only paint her nails once a week, so if she picks them off earlier she will have naked nails until the weekend. Picture Polish Wanderlust is available from Picture Polish. International readers may be able purchase through one of the many Network stockists if they have this in stock. 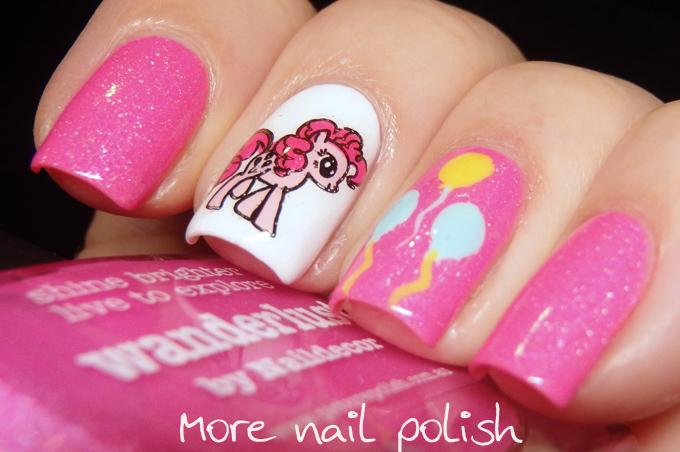 Awwww Love this design! It´s super cute!